“Compared to other stars, our Sun is a remarkably steady source of light and heat, but its output does vary. 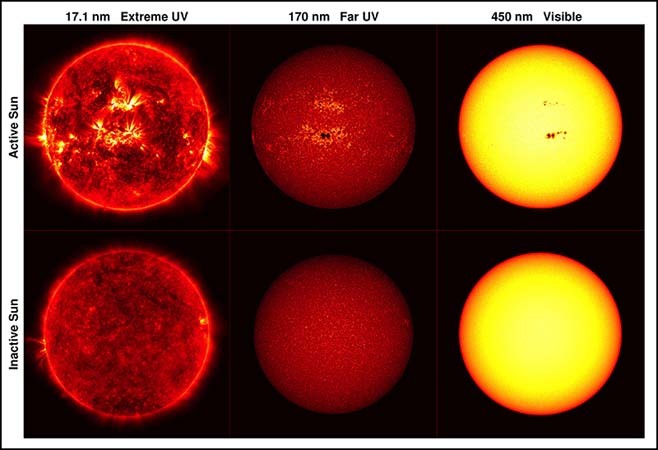 Solar light, heat, and particle streams drive weather and atmospheric chemistry, but how (and how much) does the Sun’s variability affect the climate here on Earth? The role of solar variability in recent global warming is not just a bone of contention; it is also a question of overriding importance for the scientific understanding of our Sun and of climate change. “Scientists simulate historical and future climates by setting up a suite of initial conditions and seeing how these conditions change when various factors, called forcings, are applied. For example, how does Earth’s surface temperature change if it receives more or less heat from the Sun? How do the streams of ionized particles that make up the solar wind affect certain weather patterns on Earth? Data sets compiled from historical records provide the necessary information for model forcing, so ensuring that these data sets provide accurate, relevant information is key to producing realistic climate model scenarios. and K. Matthesonline posted September 4, 2018 at eos.org.